"A little boy had a toy boat. He made it from a can, a cork, a yellow pencil, and some white cloth. This is that toy boat's story." 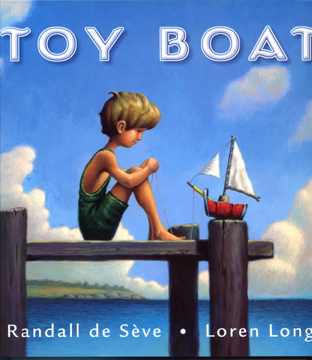 A sweeter story you will not find about a relationship between a boy and his boat. The illustrations are artistically beautiful and the emotional connection made between the reader and the boat is powerful. Buy this for your children the moment it becomes available. The inspiration came from the author's true experience of making a boat very much like this one with her daughter Paulina. The only disappointment is that Paulina turned into a boy in the book. I wonder whose decision that was? Too bad girls continue to be relegated to traditional thinking. Oh well, perhaps a sequel? For more books, visit our reading lists for adults and for children.